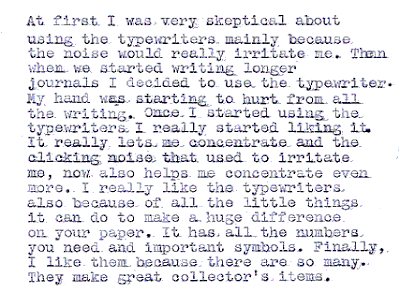 Enrique's response to "What do you like about using the typewriters in class?" EDITORIAL: I apologize for the quality of this scan. I intend to rescan it as soon as possible. The paper on which it is written is not, in fact, gray. Interesting, and perfect typing and spelling too! He did spend some time on it. After a while there was a small stack of rejected drafts and eraser dust. Others, while not the best in spelling or style, are as interesting.